The Hangzhou Tian Yuan Tower (l) is a go player’s dream come true. Basically, once you step through the front door, you never have to leave again. 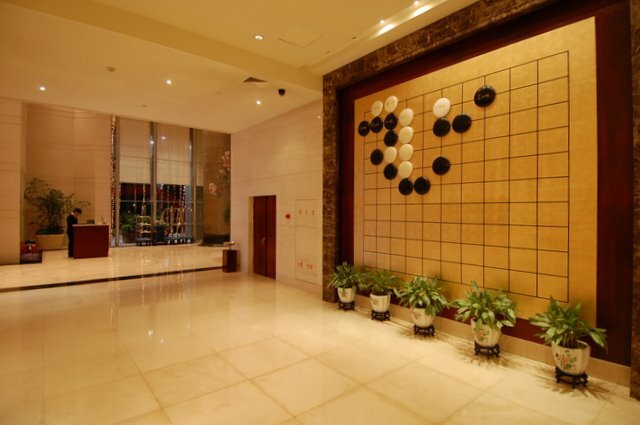 Like upscale hotels around the world, the Tian Yuan contains well-appointed rooms and several different restaurants featuring Chinese cuisine, but this special place also include facilities for playing and studying go. To dispel any doubts about the building’s go theme, the fountain in front features a large go bowl and stones, a wall in the main lobby (below) has a huge go problem with the names of famous Chinese go players engraved on the stones, and the main restaurant is housed in a massive go bowl spinning slowly atop the building, providing dramatic – if hazy – views of the area’s famous lake district, as well as the rapidly burgeoning Qianjiang New City, a brand-new Central Business District that is planned to be the political, economic and cultural center of the Hangzhou city of the future. 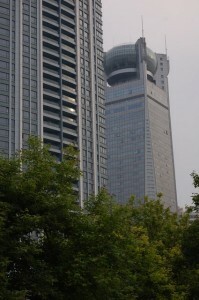 Completed just three years ago in 2007, the Tian Yuan is owned by the Hangzhou Go Association, which uses the first ten of the buil ding’s 37 floors for go-related activities and rents out the rest to the hotel and other tenants. The Association’s administrative offices and go classrooms – called “combat rooms” in English – are on the fourth floor, along with an extensive wood-paneled library (l) of go books in Chinese, Japanese and Korean. The Association has already hosted a number of professional tournaments since the Tian Yuan opened – the facility is designed and equipped to handle the special needs of go tournaments as well as hundreds of players, officials and media — and the finals take place in the Ling Long Hall (r), a well-carpeted room on the fourth floor with low tables and leather-cushioned chairs. Down the hall, in Room 406, the Hangzhou Go Team – comprised of 10 pros who live at the Tian Yuan — trains for their tournaments. Next door, in Room 405, local go students play and study in the evenings. Tucked away in Room 410 is a go store (l) run by Yawei “Robert” Wu, who owns a factory in Hunan province that supplies a chain of nine such go shops across China. Here you’ll find everything from an inexpensive paper board to gobans made of bright yellow new kaya and his top-of-the-line board, a traditionally-carved Chinese-style board made of glossy dark wood that’s been buried for 80,000 years and sells for nearly $900 (though bargaining seems to be expected). 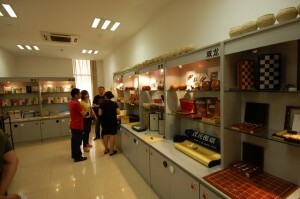 A go museum is slated to open later this year, containing historic go boards and stones, pictures of famous Chinese players and more, including the oversized world map signed by all the players at the 31st WAGC. 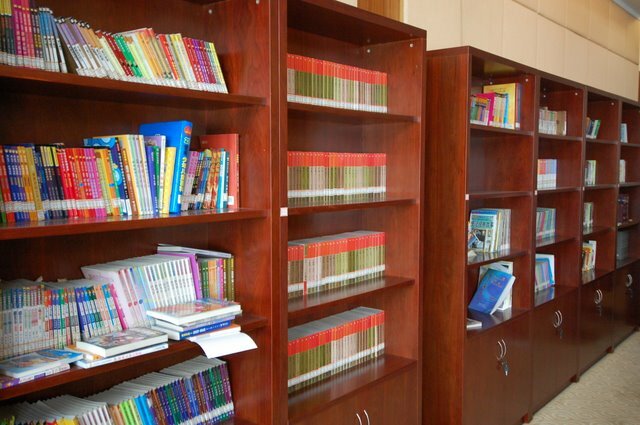 There are additional training rooms on the third floor, and several floors of hotel-style rooms for the pros and resident students, as well as visiting groups like Feng Yun 9Ps annual summer school, which is set for July this year. It’s possible to arrange a visit as an individual, but guide Lang Qin Fang says the cost would likely be prohibitive and they encourage those interested to instead join or organize groups such as Feng Yun’s. Although the area surrounding the Tian Yuan Tower is still very much a work in progress – restaurants and other cultural attractions are a cab ride away in the old downtown — the many attractions of Hangzhou’s West Lake District may prove irresistible for even the most dedicated go player.